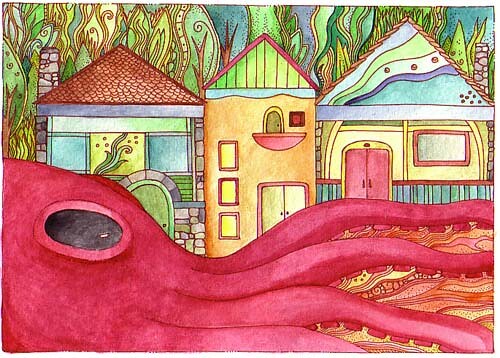 You could win an Octopus Village Print ! 052407art1, a photo by megan_n_smith_99 on Flickr. The original is ink and watercolor. For a chance to win leave a comment below telling me why you like octopuses! I will pick a random winner of Friday 3/29/2013. I need to be able to get in touch w/ you after the drawing - sometimes that has been a problem - so please check back to see who is the winner. I will post it on Friday. Beaded Owl Necklace, a photo by megan_n_smith_99 on Flickr. 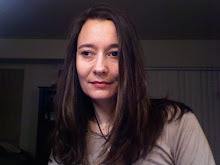 I have been working on some new necklaces - trying to find ways to incorporate beadwork into more aspects of my artwork - and i guess my life - and the world. I've started a new series of small bead embroidered pieces set into bezels. This is one of them, and you can see it plus two others on Etsy. Shaman, a photo by megan_n_smith_99 on Flickr. I have been doing beaded paintings as of late and this is one of my favorites. 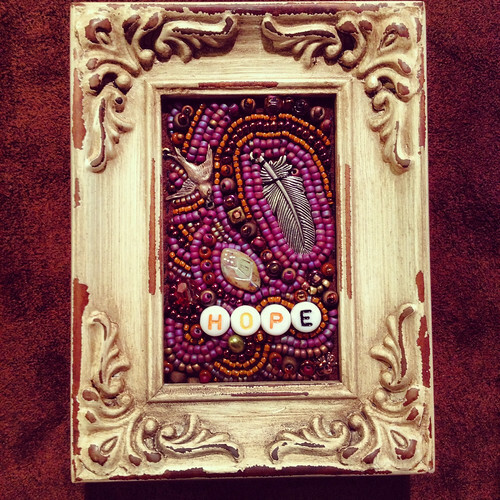 I just loved the frame and I made the piece specifically to go with it. The ceramic face is from Earthenwood. 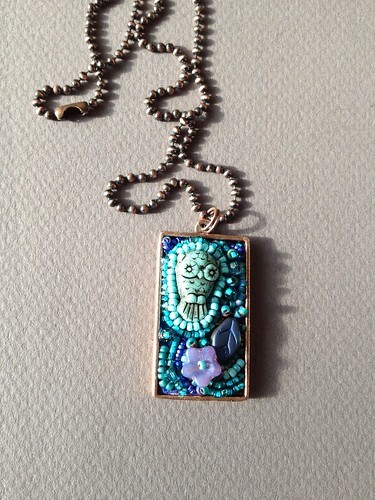 I also used seed beads, glass beads, a freshwater pearl, and a copper feather charm. 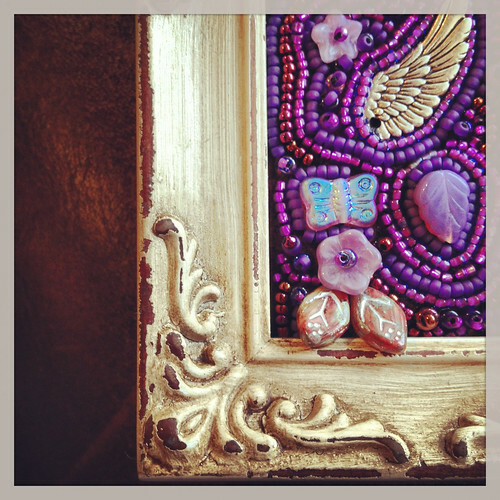 The frame is 4 & 3/8 x 3 & 1/2" and the beaded portion is 3 & 1/4 x 2 & 1/8". I was feeling like a hermit today, but I managed to get a doctor's appointment when someone canceled, forcing me to leave the house. After my appointment and stopping by the lab, I felt inspired to sit in the sun and read for a while. I am glad something gave me an excuse to do that! And I must do it again tomorrow if it is at all nice out. I know some of you are digging out from under snow right now -- I hope Spring arrives for you soon! Shaman is available on Etsy. moleskine, a photo by megan_n_smith_99 on Flickr. 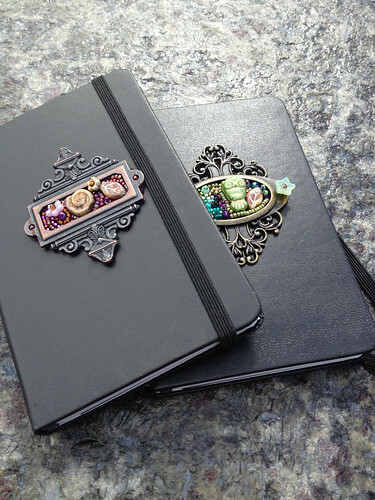 These are two of the beaded moleskines I have made recently and which are on Etsy. They were fun to do. I love owls. well, really I love all animals. I saw a meme recently saying something like "When I meet a new animal, my 1st reaction is to make friends. When I meet a new person, my first reaction is to avoid eye contact and get away." I don't really like to think of myself that way, but I guess there is some truth to that. I don't have any pets because my condo is so small, but I do enjoy meeting all the dogs that live in my building. Yesterday was gorgeous and I got out and enjoyed it! I read in the park. It was lovely - I think that's the 1st time I have done that this year. And I guess it was worth it, even if my seasonal allergies are in full-swing this morning. Perhaps this tea I've made will wake me up and I'll go out into the world again today, armed with a book, a sketch pad, and some pens. Autumn Creatures, a photo by megan_n_smith_99 on Flickr. Granted, it is Spring. 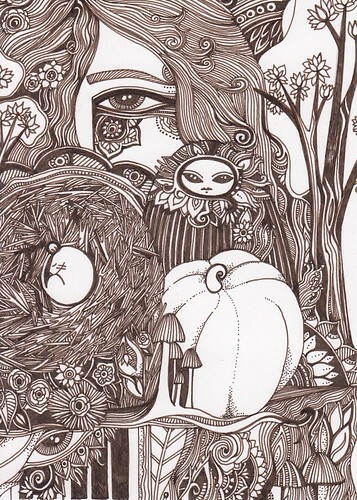 But I still love autumn themes and without really planning to, I drew this the other day. I suppose the urge to hibernate is till strong within me, though we have had a few nice days. (Yesterday afternoon was quite sunny and nice, after the morning snow of course.) My building is currently wrapped in a product called Scaf-Lite. That's the stuff they wrap buildings in when they are being worked on. It lets in more light than I would have expected, but it's a sort of muted and grey light and I have to go out to determine the weather. I will be so glad when the repairs to my building are finished! So, I think living in a somewhat grey world has possibly induced my hibernation response, which frankly is never far below the surface, and hence we have this cozy little mouse, pumpkin, mushrooms, toadstools, and more. I can walk down the street and spot tiny mushrooms and flowers on the parking strips, I can spot spiral shells the size of the head of a pin on the beach, yet I still walk into furniture and fail to recall the names of all of my neighbor.--in my myopic little world, rich with detail, but sometimes a little cut off from the rest of the world. Deep Time, a photo by megan_n_smith_99 on Flickr. "Deep time is the concept of geologic time. 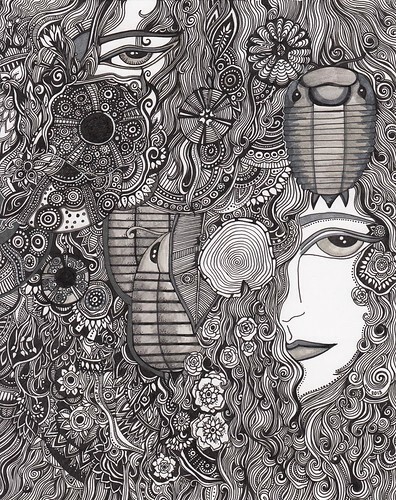 The modern philosophical concept was developed in the 18th century by Scottish geologist James Hutton (1726–1797)"
I had a good time with this drawing, parts of which were inspired by Ernst Haeckel's work. . He did many intricate and beautiful drawings of creatures from the sea and the land, the present and the past. Here I have included living and extinct sea urchins, barnacles, trilobites, and more. Sea urchins and some of their relatives have five fold symmetry, which I knew when I started this drawing. I thought barnacles also shared this trait, but while drawing this I realized that at least some groups of barnacles have six-fold symmetry, which was very exciting. Barnacles are more closely related to crabs and lobsters than they are to sea urchins. And the larval stage of barnacles roam and drift about until they are ready to settle down and attach to a rock or boat or piling. Well! I've often seen a cat without a grin," thought Alice; " but a grin without a cat! It's the most curious thing I ever saw in my life!" Well, this is a cat with a grin! 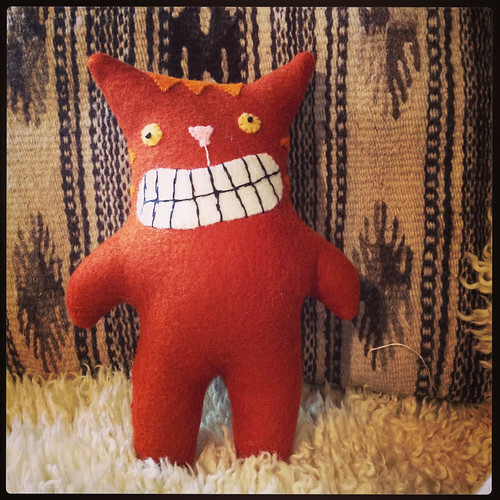 Cheshire is available for sale, and I also have grumpy cats & custom cats to look like your favorite cat, from real life, a book, a movie, what have you! 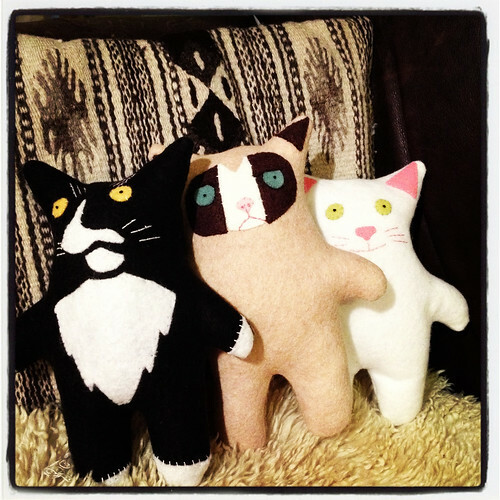 3 kitties!, a photo by megan_n_smith_99 on Flickr. I have started working on cat portraits. Here we have Sigrun, Grumpy, and PJ. Sigrun belongs to a friend of mine. She actually looks slightly more tolerant here than in general. She's a beautiful cat but always looks a bit distainful. Humans are so sub-standard. Grumpy - well, I am sure you know who inspired HIM. And PJ is a sweet old-lady cat. She's 18! I do have a weakness for white cats. I would be happy to make a cat portrait of your cat, or your favorite cat from tv, fiction, etc. Most cats are $35. Feel free to send me an email if you have questions! Beaded Scarab Painting, a photo by megan_n_smith_99 on Flickr. 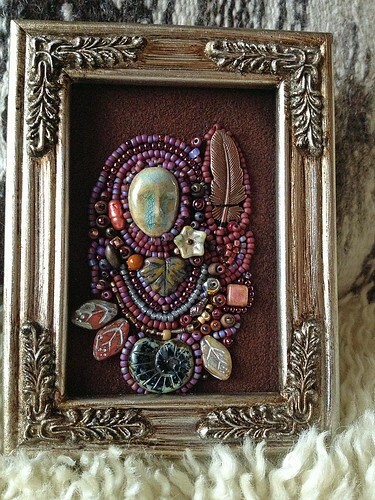 I have been working on some new small beaded paintings in interesting frames. The frames are included as part of the piece and each piece is custom designed to work with the frame. I was especially happy with how this piece came out. I was thinking of the Victorian passion for naturalism. Back in those days, if you were a gentleman of leisure (do those still exist?) you would naturally become an amature naturalist, collecting butterflies and insects to mount, recording observations in a journal, and taking collecting trips through forest and field. This elaborate frame reminded me of those times. Dimensions: The frame is 5 & 1/4 x 4 & 1/2". The beaded portion is 2 & 1/4 x 2 & 5/8". 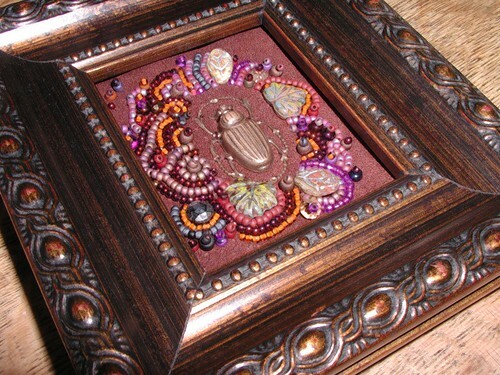 Media: antiqued brass scarab and glass beads charm sewn on Ultrasuede, + frame. The frame is included. Beadwork, a photo by megan_n_smith_99 on Flickr. I'll have Easter goodies, new beaded paintings, watercolors, pen & ink & more! Secret Life of Plants, a photo by megan_n_smith_99 on Flickr. 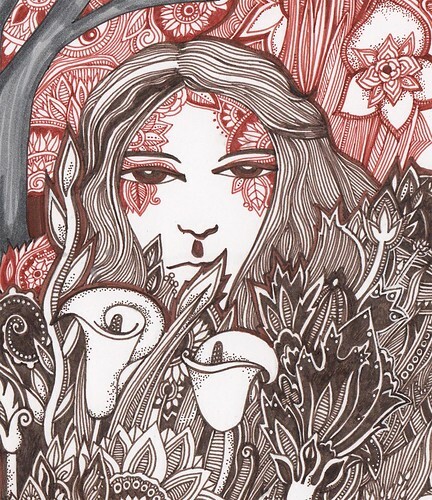 This intricate pen & ink drawing features a solitary gardener, delicately tattooed or embellished or shadowed and entanged with leaves, vines, trees, roots, and flowers. like a dream, you lose yourself in another inky world. The title was taken from a book byPeter Tompkins and Christopher Bird. There is also a quote from poet and diarist May Sarton - also used as one of her book titles - "Plant Dreaming Deep." The Secret Life of Plants, detail. The secret life of plants, detail, a photo by megan_n_smith_99 on Flickr. 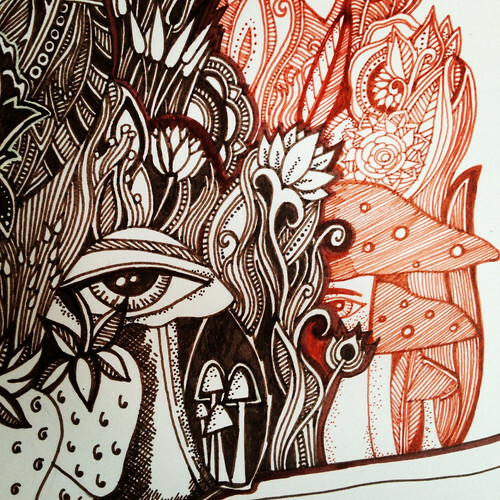 This is a little sneak peak of the last pen and ink drawing I finished. I need to scan it. I started another one but am also working on some other projects, and actually i have a sinus infection and am not up for working on much of anything. Hope..., a photo by megan_n_smith_99 on Flickr. I can't help noticing how much authors from the late 1800s loved to use dashes. I suppose it was a way of ornamenting the words, just like they covered everything else with trim, beads, ribbon, etc. Which makes this vintage-style frame appropriate for this piece as well. I have a number of art ideas at the moment but am still getting over my cold - or what the Victorians probably would have called the vapors or something, so anyway I am going to get some more tea and go back to my book now. Oh! I did pin some more paintings that inspired me, you may enjoy seeing them here.